Now there is an answer and a way everyone can lend a hand to the four-day conference and events surrounding the visit of Pope Francis to Philadelphia this September. Registration for volunteers is now open at the World Meeting of Families 2015 website, through its secure portal. 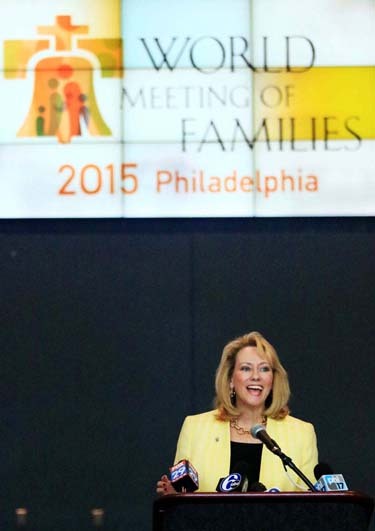 The long-anticipated opportunity to volunteer was announced at a press conference Monday, April 27 at the Pennsylvania Convention Center in Philadelphia, where all the family-themed congress sessions will be held Sept. 22-25. Now only five months away, the papal events to follow the congress are expected to include a visit from the pope to the Festival of Families on Sept. 26 and the large outdoor Mass on the Benjamin Franklin Parkway that he is expected to celebrate for up to 1.5 million people Sept. 27. Farrell led speakers from the business and academic communities in Philadelphia plus officials from the convention center in making the announcement. Some 10,000 volunteers will be needed for many roles at the congress and to welcome Pope Francis to the city, Farrell said. Tasks include giving directions to visitors in the region, welcoming them to Philadelphia International Airport or 30th Street Station and even acting as “digital diplomats” – volunteers posting all manner of information on social media platforms. “Whatever your talent, whatever your passion, there is a role for you,” she said. Security is a major concern for event organizers, so volunteers will be screened through a criminal background check. After visitors register their personal information initially on the website of the World Meeting of Families, they will receive a confirmation email. Farrell emphasized the importance of waiting for a second email message, after 24 to 48 hours, for confirmation that they have been accepted for volunteer duty. Volunteers will also be invited to indicate specific preferences for service or talents that would be better served in one role over another. For instance, a person with the skills to translate a foreign language or a person with artistic abilities may be assigned to serve in those roles. All the volunteers for the effort will be recognizable in unique and colorful uniforms to be supplied by Aramark Corp. 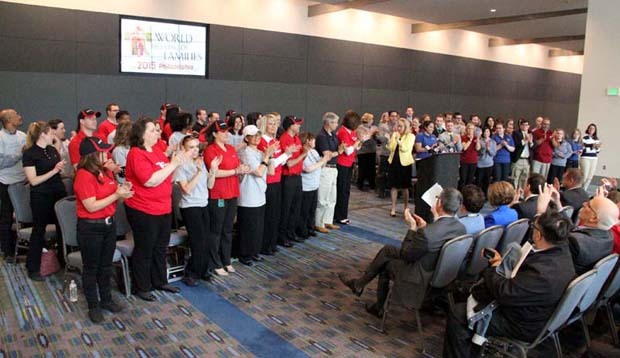 The Philadelphia-based food services giant was one of a contingent of companies that will provide volunteer support and were present at the Monday press conference. Others included Independence Blue Cross and Campbell Soup. Volunteers will also be sought from the more than three dozen colleges and universities in the region, including 12 Catholic institutions. Representing them at the conference were Cabrini College and Neumann, St. Joseph’s and Villanova universities. One of those Neumann students, senior Jillian DeFina, already accepted the invitation. St. Joseph’s University graduate Maria Montero, who now is working as a manager with the Pa. Convention Center, will lead an event she called Hawks on the Parkway, part of the Festival of Families on Sept. 26. She hopes to continue “the Jesuit tradition of volunteerism” and will invite representatives of every Jesuit-run college and university in the world, in addition to the 28 such schools in the United States, to the event. “I’m excited about the opportunity to help, and to show that Jesuit education can make a difference,” Montero said.